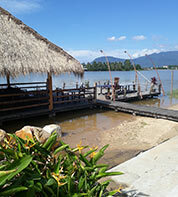 Dining... Kampot’s culinary scene is quickly expanding, both in number and variety. 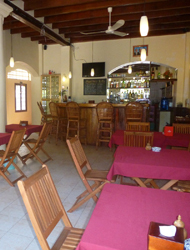 There is now a choice of good dining in Kampot well worth exploring. 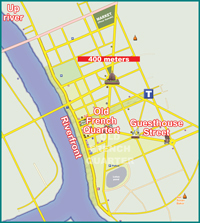 Most of the restaurants and bars can be found clustered into a few blocks along the picturesque riverfront road and Old French Quarter, especially near and around Phsar Kronat. For a local streetfood experience check out a dozen small local restaurants and streets side stands that line the Old Bridge Road near the Durian Market. The restaurants serve mostly fried foods, BBQ and soups and the streetside stands have noodles, pate sandwiches and fruit shakes and more. A very local experience. Drinking... Like the dining scene, the in-town tippling options are quickly growing and choice is broadening, including a few upscale places and several bars open past midnight. 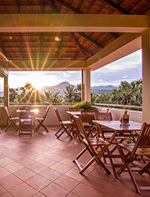 The guesthouses up river offer a headier party scene - chill-out decks, riverside bars and live music. In town, many of the restaurants double as bars. Rikitikitavi, MAKK Hotel and the new Fishmarket on the river offer some of the best sunset views in town, and the pizza places along the riverfront have some of the best happy hour deals. Most of the town closes by midnight but a few bars open quite late including Oh Neil’s, bARACA, the welcoming Madi’s Bar on and near the riverfront. Madi’s also serves up live music Thursday evenings, as does Bayan Tree Guesthouse upriver, featuring live music every Friday. Kampot now has a Mediterranean choice. Kebabs, wraps, shawarmas, and lots of vegetarian options including falafel, hummus, tabbouleh, mezze, all homemade from scratch, including the breads. Wine selection and a pleasant atmosphere, the place has heart. Noon-10PM. Set in a very nicely restored colonial era building in the Old French Quarter, Auberge du Soleil specializes in Swiss Cheese Fondue and Röstis, as well as French and Asian dishes. The Duck Breast with an Orange and Honey Glaze and the tender Beef Filet with a "Marchand de Kampot" Sauce are recommended. Wine selection, full bar, cocktails and liquors. 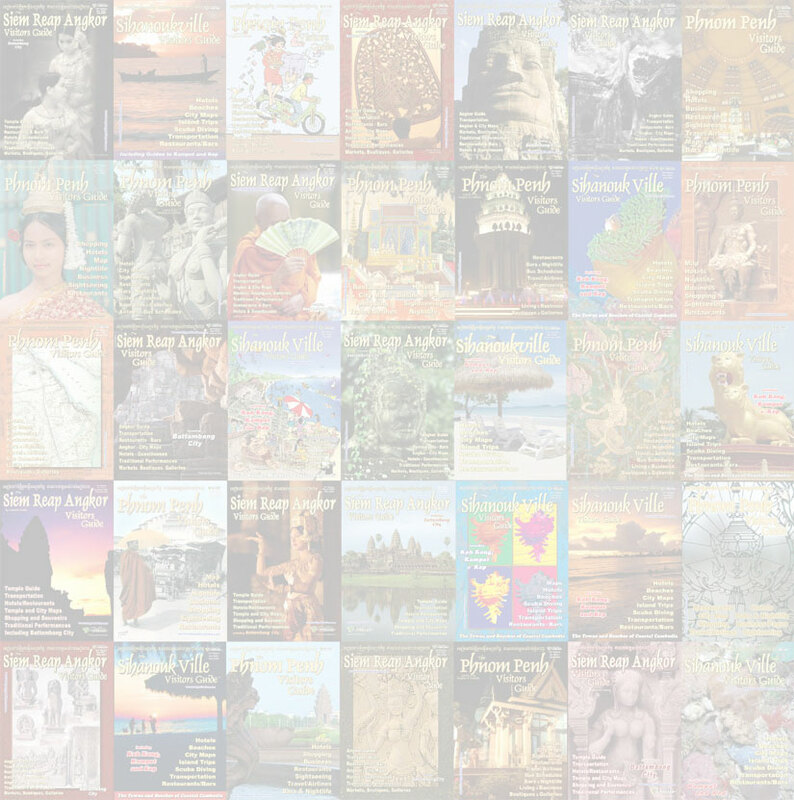 French, English and Khmer spoken. River’s edge guesthouse, bar and restaurant upriver of town about 2km. Full bar with fab cocktails, and open decks over the river. 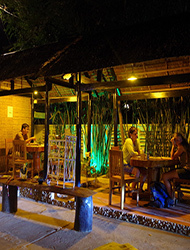 Laid-back, chill-out atmosphere in the day and a party come evening, with live music every Friday night. Local restaurant on the Bokor Mountain Road, next to the Yeah Mao Monument near the top. Clean dining room with fans. Serving Khmer food and some western dishes, both meals and snacks. Small bar with beer, wine and a few cocktails. Inexpensive place for a snack or quick meal. Reasonable prices. Coffee and atmosphere. Southeast Asian coffees roasted in-house. Good selection of espressos, perfectly brewed. Breakfast, lunch, baked goods, homemade condiments & vegetarian options. Free wifi. Sometimes not so easy to catch open, but worth the effort. Recommended. A couple of blocks off the riverfront, half a block from Phsar Kronat and Epic Arts Cafe. 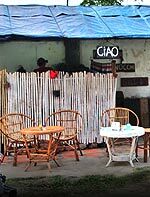 Unique little super-cheap streetside pizza and pasta place among several Cambodian streetfood places. Very good fresh made pasta. 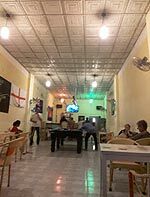 Welcoming little bar frequented by expats with streetside and indoor seating, pool table and TV. Fully stocked bar with a decent range of beers. Home cooked food with regular specials. Open 12 - 11pm mon - Sat. Homey little Italian restaurant serving up some excellent Italian dishes and getting very good reviews in the process. A selection of pastas, pizza, ravioli, gnocchi, tuna tartar and more. A good choice of desserts too, including a very nice tiramisu. Wines, spirits, beer. 9AM-11PM. Mini theater and private a/c movie rooms. 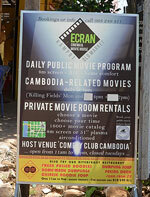 Regular features or choose your movie for a private room. Big plasma screen and 4m screen. Serving food including fresh pulled noodles, excellent dumplings and dumpling soup. If noodles are your thing, this is THE place to go. Delicious! 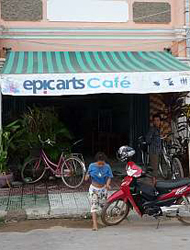 The new Kampot branch of the long running and popular Ecstatic Pizza from Phnom Penh (also in Sihanoukville and Siem Reap.) 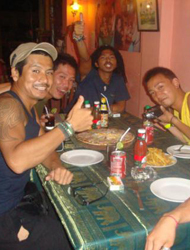 Serving the same wide selection of reasonably priced pizzas and pastas and well as Khmer dishes. Happy hour 7PM-11PM: 50¢ draft and $1.50 cocktails. 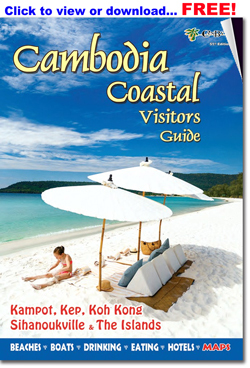 A little Kampot gem. 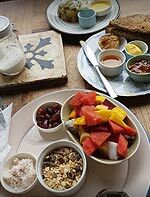 Pleasant café (with sidewalk and indoor seating,) offering a fresh menu of salads, sandwiches on fresh baked bread, crepes, mains on the board and a very nice all day breakfast, and a few solid vegetarian choices. Juices, smoothies and good coffee. Recommended, especially for breakfast. 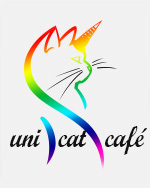 Established in 2006, Epic Cafe provides work opportunities for deaf and disabled people and is a model of an inclusive work space. Comfortable corner restaurant near the Old Market. Serving western breakfasts, sandwiches, soups, home-made cakes, teas, juices and more. Refined ambiance and a brilliant river’s edge location with one of the best sunset views in town. Local and western dishes, well prepared, imported Aussie lamb and sirloin, fresh Kep style crab, pan seared salmon, shrimp & fish ceviche and more. 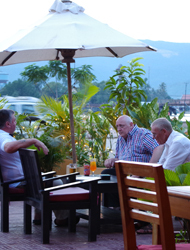 Full bar, coffee bar, terrace seating over the river, excellent service. 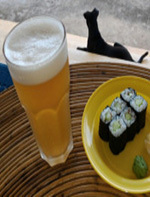 Craft beer and sushi rolls (and a home stay)! Very unique place, brewing it’s own beers on site and serving a good choice of sushi rolls (most for under $2,) and other Japanese fare (miso soup, endmame beans...) for eat-in or take out. 3:30PM-9:30PM. Japanese and English spoken. 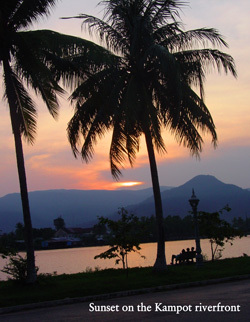 Kick back and enjoy a beer and a pizza just off the riverside at Happy Kampot Pizza. In fact, have a few. Draft beers are just $0.50 all day long, and pizzas start at $4. With a wide range of toppings, pizza is their most popular offering, but they've got a large selection of inexpensive pastas, burgers and Khmer food, too. Free delivery. Riverfront pizza place with a huge menu, full bar and great sunset view. Western breakfast, sandwiches, salads, burgers, a selection of pasta dishes and near 50 varieties of pizzas. Fresh fruit shakes. Beer, wines, cocktails. Very reasonable prices. 7:00AM - Midnight. KAMA is a professional not-for-profit arts organization whose mission is to develop and present locally produced music and art. KAMA's live music venue "The Sun Ra Space Bar" features great food, cocktails, quality wines, groovy art and original live music. Open 6PM-midnight, Wed-Sun. Very pleasant rooftop bar and restaurant with lovely countryside view. Fusion food, some excellent Mexican food (try the tacos!) and several veg choices. Full bar with house-made cocktails and an especially good choice of cocktails. Friendly little riverfront pizza place serving pizza, pastas, burgers and a variety of surprisingly good and affordable Khmer dishes. Full bar. Cold beer, cocktails. Streetside seating and inexpensive drinks make for a good sunset spot. Open: 7:00AM - 11:00PM. Pleasant little bakery/deli/coffeeshop located just off the river road. Fresh baked pastries, pies, cookies, good coffee, shakes, fresh juices, frappes and more. Also a few light meals including burgers, chili dogs, chicken curry pie and even poutine. Wifi. New French bakery, café and coffee shop, fully air-conditioned, comfortable seating. Nice place to escape the heat. Large selection of French breads, pastries, pies and cakes. Cakes made to order. Value priced western breakfasts. Snacks including a variety of sandwiches. Full bakery. Extensive breakfast, lunch and dinner menu featuring large portions of everything! Try our Eggs Benedict and huge sandwiches, baguette pizzas, Indian specialties and western mains. 65" and 2.4m sports/movies TVs. 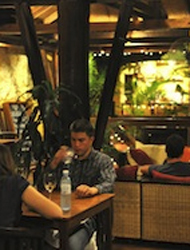 Full bar, frozen mugs of beer, Cambodia’s largest single malt scotch collection, two happy hours. 6:15AM – 9:00PM. 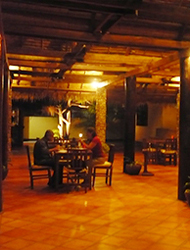 Pleasantly quiet patio garden restaurant and bar set off the main road in a tranquil corner of town. Serving nicely done international fare including excellent pizzas from a wood-fired oven. Good salads and sandwiches as well. Excellent service. Friendly place. Kitchen closes at 6:00PM. Recommended. 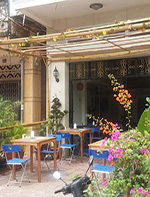 Next to Phsar Kronet, Nara’s offers good home cooked Cambodian food and western comfort food at very reasonable prices. Desserts including ice cream, pancakes and apple pie. Also a full bar with 75 cent draft all day. Free wifi. 6:30PM - 10:00PM. Guesthouse rooms available. Come very late night, if any bar is open, Oh Neil’s on the riverfront is it. Reasonably priced, generously poured drinks, party atmosphere, pub grub, on the riverfront. Really good late evening place. 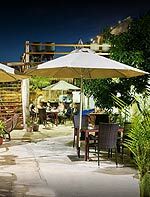 Run by a Japanese-French couple, featuring a careful selection of authentic Japanese dishes that are served in the breezy garden courtyard of the Rainbow Bridge Guesthouse. 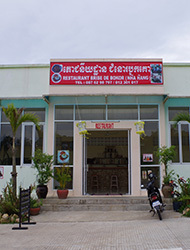 Their specialty is nigiri, made with both imported and local ingredients, including Kampot squid, shrimp and horse mackerel. They also serve cooked items such as Japanese fried chicken and okonomiyaki, a type of Japanese "pizza." A small boutique in the courtyard sells a curated selection of local handicrafts and jewelry. 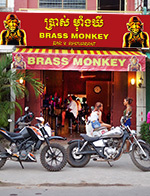 Some of Kampot’s finest dining. Portuguese restaurant serving a variety of traditional dishes. The focus is on seafood, though there are also plenty of meat options. Cocktails and a selection of wines including Portuguese choices. A/C seating and an al fresco terrace with a view. Lovely al fresco restaurant on the riverfront, at the riverside end of Phsar Kronat (the Old Market). A friendly ambiance at very reasonable prices. 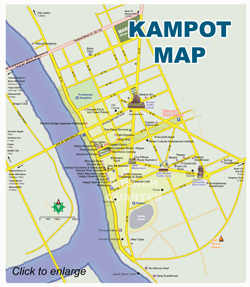 Offering a good selection of both Cambodian and western classics, from Mexican Burritos to Fresh Shrimp in Kampot Pepper. Full bar and wine selection. Nice place for a sundowner. Set in an open area with a nice breeze off the river and a sunset view. Come and spend time with our adorable rescue cats from the Pagodas! Enjoy their furry company in a quiet and friendly environment to play, feed and provide much needed affection. We also serve snacks, sweets and delicious coffee, tea and a wide variety of shakes. If you just enjoy our cats company without purchase, we will charge a small fee of 2$ per 15 min to cover the costs for providing our furry friends a friendly environment. Breezy corner restaurant at the end of the Old Market. Choice of European, Turkish and Khmer dishes ranging from Bratwurst to Amok. The German sausages are particularly good. Full bar and cool jazzy music. Value-priced western breakfast from around $3. Open: 8:00AM-10:00PM. Corner of the Old Market, one block off the riverfront. 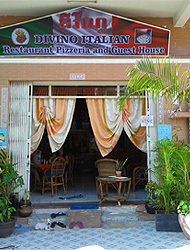 Friendly little riverfront pizza place serving pizza, pastas, burgers and a variety of good Khmer dishes. Full bar. Cold beer, spirits, cocktails. Open 7:00AM - 11:00PM. Free delivery. Call a pizza to your hotel or guesthouse. Come very late night, if any bar is open, Oh Neil’s on the riverfront is. 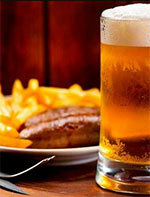 reasonably priced, generously poured drinks, party atmosphere, pub grub, on the riverfront. Really good late evening place. Run by a Japanese-French couple, Rainbow Bridge Japanese Restaurant features a careful selection of authentic Japanese dishes that are served in the breezy garden courtyard of the Rainbow Bridge Guesthouse. Their specialty is nigiri, made with both imported and local ingredients, including Kampot squid, shrimp and horse mackerel. They also serve cooked items such as Japanese fried chicken and okonomiyaki, a type of Japanese "pizza." A small boutique in the courtyard sells a curated selection of local handicrafts and jewelry. 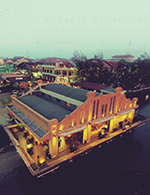 Charming balcony restaurant and bar with a lovely view overlooking the riverfront and mountains. A great place to enjoy sunset - the only riverfront place with a balcony view, and offering a wonderful cool river breeze. 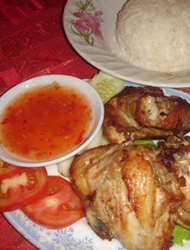 Serving a wide selection of western and Khmer dishes prepared by a professional chef. Generous portions. Cozy balcony bar offering cocktails, cold beer, a selection of wines and fine spirits including a choice of single malts. Great service. Popular place. Open 7AM - 10PM everyday. 2 for 1 happy hour 5PM - 7PM. Lovely al fresco restaurant on the riverfront, uniquely placed at the riverside end of Phsar Kronat (the Old Market). A friendly upscale ambiance at very reasonable prices. Offering a good selection of both Cambodian and western classics, from Mexican Burritos to Fresh Shrimp in Kampot Pepper. Full bar with a good wine selection. Nice place for a sundowner. Set in an open area with a nice breeze off the river and a sunset view. A little Kampot gem. Pleasant café (with sidewalk and indoor seating,)offering a fresh menu of salads, sandwiches on fresh baked bread, crepes, mains on the board and a very nice all day breakfast, and a few solid vegetarian choices. Juices, smoothies and good coffee. Recommended, especially for breakfast.